The workshop features three weeks of education designed to enhance and build upon their training, experience and skills, to prepare them for life after the military. Each week focuses on a different aspect of the transition, starting with the personal transition, then the lifestyle transition, and finally the career transition. Wilson explains that on the first day of the career-focused third week, they ask the military members “What is your next destination?” The members are asked to visualize their future career in terms of salary, environment and people, so that they can focus on their interests and hone in on the industries that best fit them. Once that’s done, then the focus shifts to résumé and interviewing techniques. Nanzer adds that the value of the REBOOT workshops cannot be understated. “Transitioning service members need the innovation, support and tools provided by the staff of REBOOT to set themselves apart in today’s challenging and competitive labor market,” he says. NVTSI was founded by Wilson and Chairman Ronne Froman in 2010. A retired 2-star Admiral, Froman has held numerous leadership roles in both military and civilian life. Prior to retirement from the U.S. Navy, she was the director of Ashore Readiness for the Chief of Naval Operations, responsible for nearly 90 Navy stations and bases around the world and a $7 billion budget. Wilson served 25 years in the U.S. Navy in various positions of senior enlisted leadership and is a graduate of the Navy’s Senior Enlisted Academy. 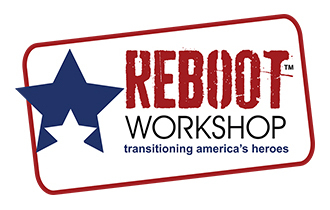 For more information about REBOOT, including a detailed description of each week of service, visit www.rebootworkshop.org.